The first deployment on the new Manasquan Inlet Reef site is scheduled to take place on or close to June 21. The deployment consists of 1,500 tons of precast concrete material donated by Garden State Precast in Wall Township. 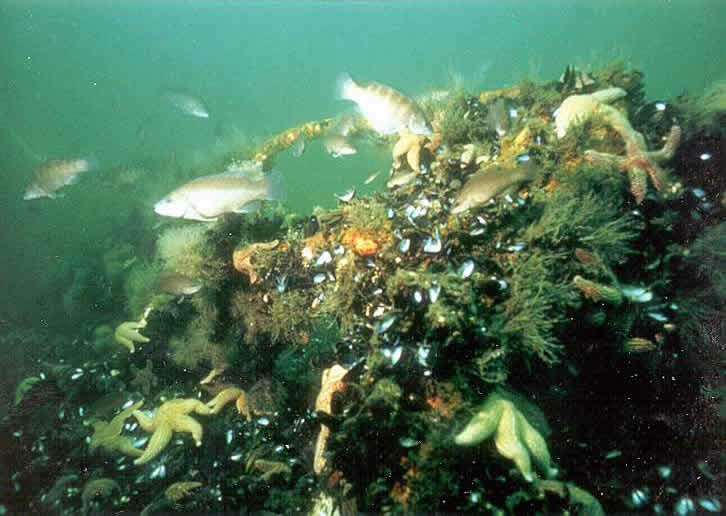 The reef is part of the NJDEP Division of Fish and Wildlife's Artificial Reef Program. The Greater Point Pleasant Charter Boat Association, with help from the Ocean Reef Foundation and the thesportfishingfund.org, have sponsored the towing and deployment costs which is being performed by the Reicon Marine Group. After this deployment, the submerged material will provide housing to over 150 marine organisms including Summer Flounder, Black Sea Bass, and Tautog. Once the concrete is deployed it will serve as an attachment surface for mussels, barnacles, hydroids, anemones, stony coral and other invertebrates, which will quickly cover the structures with a living carpet, providing the base of a productive marine food chain (picture below). Soon the new reef will be colonized by black sea bass, tautog, scup, triggerfish and summer flounder. It will then become a favorite target of anglers coming out of the inlet. The deployment date is subject to weather and sea conditions. Anglers should stay clear of hopper scows and deck barges transporting this concrete because they are limited in their ability to maneuver. For information on past and planned deployments visit the Artificial Reef Deployments page. 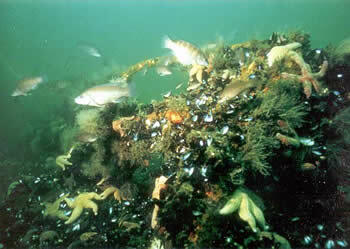 For information on the Artificial Reef Program visit the Artificial Reef Program page.